Wouldn't it be great if you could hide in your bedroom under the covers until your mood swings went away? After all, it is never easy to interact with the outside world when you are feeling frustrated, anxious, or depressed. Instead of hiding under the duvet, try venturing out to the kitchen. You will find some foods there that will help curb your often unpredictable mood. Read on to learn more. What Is Behind Your Menopausal Mood Swings? During menopause, the female body begins to slow production of essential hormones such as estrogen, progesterone, and testosterone. These hormones regulate a wide range of bodily functions, from the monthly menstrual cycle to a woman's mood. More specifically, estrogen and progesterone are thought to impact mood through their interaction with the neurotransmitter serotonin. These two hormones work to produce the neurotransmitter serotonin, which is responsible for regulating mood, by increasing serotonin receptor sensitivity and increasing serotonin receptor levels. When hormone levels drop, so do serotonin levels. Good news for all you chocoholics—your chocolate habit can help curb your mood swings. Dark chocolate is the perfect mood-enhancing snack because it contains antioxidants and signals the body to release the neurotransmitter serotonin, as well as being absolutely delicious. 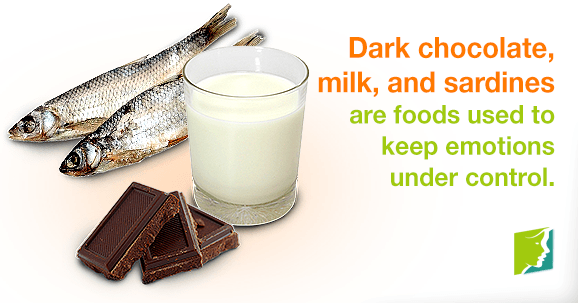 Chewing on a chunk of chocolate each day might just be the remedy you need. A glass of milk each day (or two or three) is just the refreshing beverage you need to curb your menopausal mood swings. Milk, as well as other dairy products, contains the chemical tryptophan, which can give you a good night's rest and boost your mood. Sardines may sound like an unlikely candidate for menopausal mood-enhancement, but sardines contain scores of essential nutrients, such as vitamin D and omega-3 fatty acids. If sardines don't agree with you, there are other fish alternatives, including salmon, trout, shrimp, and haddock. Mood swings are a common symptom of menopause, affecting about 50% of all women. However, in some rare cases they may also be a sign of a more serious emotional disorder, such as anxiety, depression, or bipolar disorder. It is best to consult with your doctor if mood swings begin to affect your everyday life. Click here to read more information about how to manage mood swings. Amin, Zenab, Turhan Canli, and C. Neill Epperson. "Effects of Estrogen-Serotonin Interactions on Mood and Cognition." Behav Cogn Neurosci Rev 200; 4; 43. Love, S. & Lindsey, K. Dr. Susan Love's Menopause and Hormone Book. New York: Three Rivers Press, 2003.